I’ve been on a bit of an embroidery kick lately, and along the way I’ve been dipping into my stash of old magazines for inspiration. I was intrigued by one of the articles in the August 1902 edition of The Modern Priscilla, about “Old-Time Embroidery.” It was accompanied by photographs of some pieces that seemed historically significant enough that surely I could easily find color photos and better views somewhere out on the internet, and I quickly tumbled down a rabbit hole of research. The first picture is of a charming nosegay of forget-me-nots tied with ribbon embroidered on a piece of moiré, with “Martha Washington” neatly stitched underneath. The 1902 article claims it is a bit of embroidery from the gown Martha wore to the inaugural ball. However, even the tiniest bit of modern-day research turns up enough questions to make me doubt this story. There are at least two different gowns on the internet listed as “Martha Washington’s Inaugural Gown,” with little or no support for the claim. One is in the Smithsonian, but that institution does not specify it as her inaugural gown, just simply a gown she owned. Neither gown is white moiré or embroidered. I found quotes claiming Martha couldn’t have been at the inaugural ball because she didn’t follow George to the capital until a month after his inauguration, and that she opposed his election and refused to attend the inauguration at all. Another quote says there were no inaugural balls at that time, but there was a ball in New York a week later to honor the new president. At this point, I didn’t see a reason to keep digging. Whatever the real story, it seems likely that this scrap is nothing more than a bit of lovely embroidery used by an associate to prove how cool he was because he was chummy with the first president. 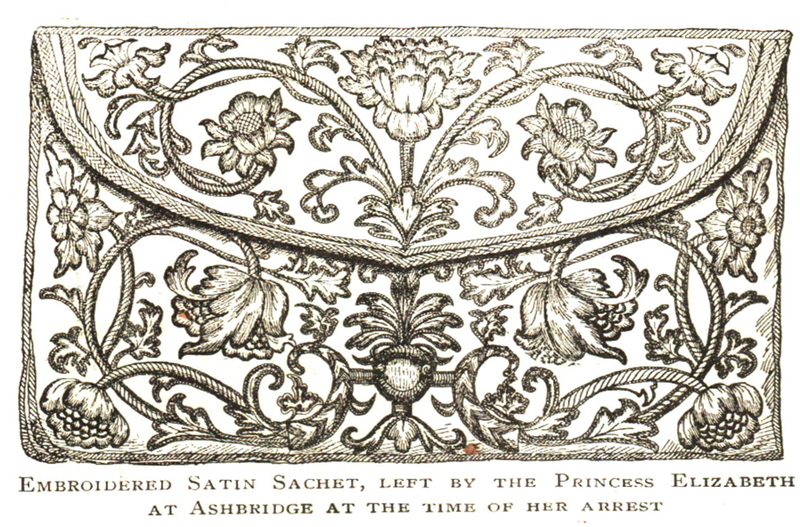 The second item is a lavishly embroidered pocketbook with the caption “Embroidered satin sachet, left by the Princess Elizabeth at Ashbridge at the time of her arrest.” This is, unfortunately, an engraving and not a photograph of the pocketbook. However, you can see a photograph of what is purported to be the same pocketbook in the book Chats on Old Lace and Needlework, by Mrs. Lowes, first published in 1908. In this case, it is said to be part of Countess Brownlow’s collection, but how it got there and where it went afterward is not clear. My internet and museum searches turned up many similar pocketbooks, but not a hint of the one pictured. My gut tells me that like the Martha Washington embroidery, someone added a story to the antique they were selling in order to raise the value. The other items pictured are almost pointless to try to identify. One is captioned “English Sampler Worked in 1799.” If, as the author claims, just about everyone had a sampler handed down from some old relative, I can’t help but wonder if this was taken out of the author’s own attic and used for a convenient photo. At least it was photographed before being lost to time. 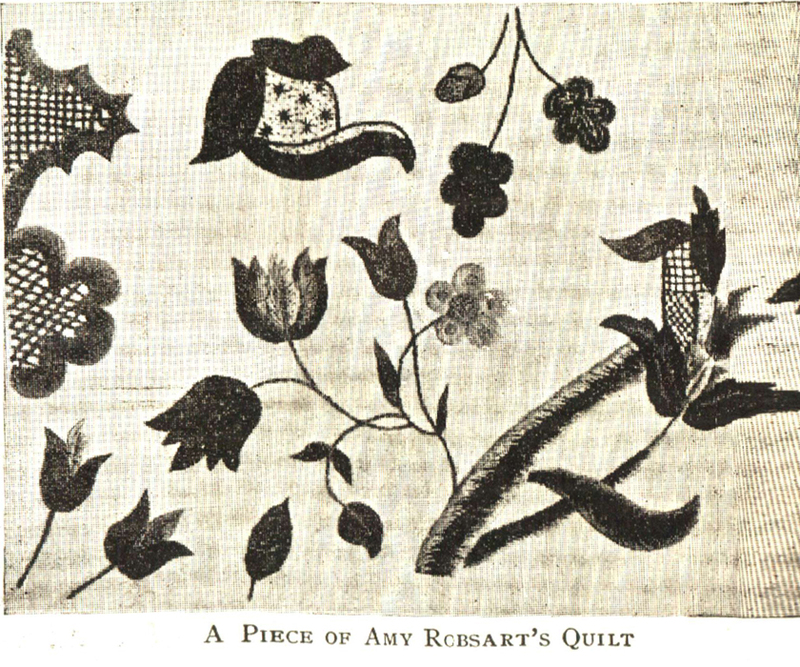 The final photo is more obscure yet, captioned “A Piece of Amy Robsart’s Quilt,” without any accompanying text to tell readers more about it. 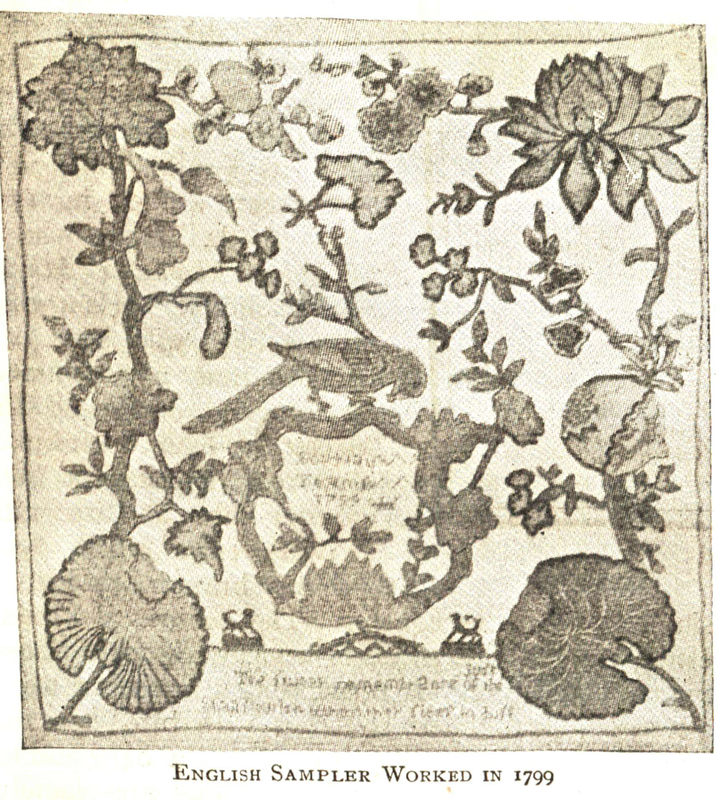 Was someone claiming this Jacobean-style bit of embroidery was stitched or owned by the wife of Lord Robert Dudley, or merely by a woman who shared the same name? Was it only a piece because you couldn’t photograph all of it, or had it been cut up for some other purpose, and this scrap had been saved? I’m sure it has a lovely history, whether real or made up, but we don’t get to read anything about it! I find it an odd journalistic quirk that the text of the article and the accompanying photos have almost nothing to do with each other. And the items in the text are so vague.. which pope? which painter? At least she could have dropped some more names, considering she’d already based the article on some wild speculation. You can hardly learn anything at all from an article like this, even though it looks so tempting on the surface. The only thing I could confirm was that Sir John Chandos is reputed to have been tangled up in his clothing, which led to his death. Froissart described him as being “dressed in a large robe which fell to the ground, blazoned with his arms on white sarcenet, argent, a pile gules; one on his breast, and the other on his back,” so that part of the story seems as accurate as can be for something that happened in the 14th century. I do find it a shame that the author seems unaware of what was possible in her own time. She couldn’t have known about the glorious peacock gown that would makes its debut a year later, but surely she didn’t believe her own statement that “we have nothing in the present to compare with the embroidery of years ago, with its magnificence of material, its lavish use of gold and silver, its richness of coloring and countless stitches?” While the 18th century did produce many exquisite works of embroidery, so did the 19th and early 20th centuries. If we stop to think long enough in this all-absorbing age, we will find that delving into reminiscences of the past is like reading some charming old romance. About the old-time needlework there lingers much of this atmosphere of charm. It needs but little imagination to fancy some living hand, then as strong and deft as our own, plying the needle and enriching the cloth stitch by stitch — the hand of some one whose fame still exists, or of some one far back in our line of ancestry, who lives yet in these voiceless reminders of their time. Famous, indeed, if only through reflected glory, is the “Mother of her Country,” – Martha Washington. 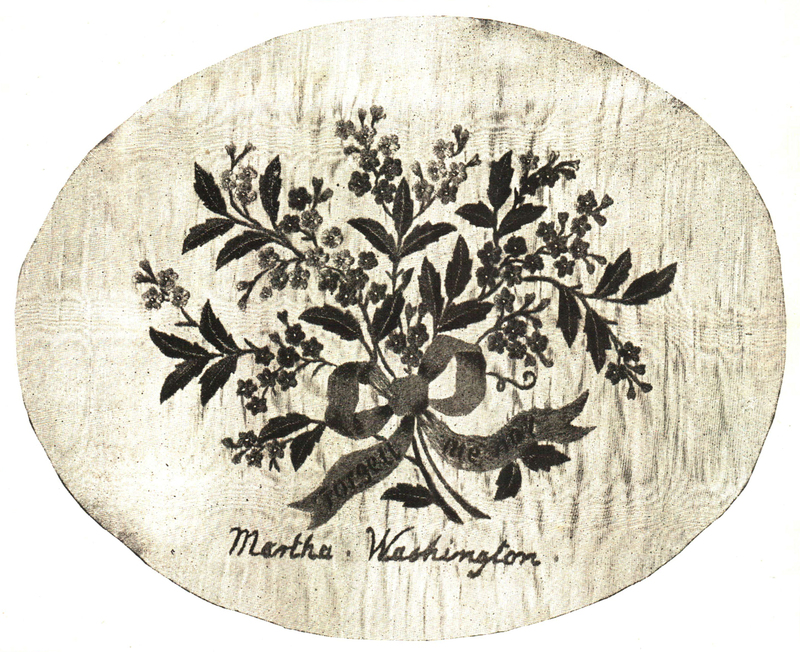 In a collection of Revolutionary relics, owned by Jonathan Trumbull, aide de camp to General Washington, is a piece of white moiré antique, richly embroidered, as may be seen in the illustration, being a part of the dress worn by the wife of the first President at his inauguration ball, and her own work, as well. Doubtless worked with these stitches was the hope that this beautiful gown might aid her in doing justice to such a high and exalted position, and many a wish for the dignified success of this grand and imposing ball. This takes us back to the days of celebrated belles and beauties, to the days of powder and patches and the stately minuet. Poor are we indeed in heirlooms if we cannot show at least a sampler handed down through successive descendants from some time-honored ancestor. The alphabet in small letters and capitals, stilted figures and flowers, and a verse always pointing out some standard of conduct, make up the sum total of their designs. But the odd little figures, the verse, and the letters speak of the laborious persistency that never relaxed until that invariable possession of every well-brought-up child was finished, a sort of certificate of education which it attested was being carried on along proper lines. In our enthusiasm for, and loyalty to, our own time, we are apt to overestimate its work. But however beautiful we may consider the embroidery of to-day, it takes very little research into the old-time history of needlework to destroy our self-importance and leave us wondering and amazed at its disclosures. We have nothing in the present to compare with the embroidery of years ago, with its magnificence of material, its lavish use of gold and silver, its richness of coloring and countless stitches. It is almost incredible the amount of time and money which long ago was spent upon embroidery. In the life of an old Italian painter a vestment is spoken of that took twenty-six years to finish. This would seem to our practical twentieth century mind a sheer waste of time, as it admittedly would be in our own day, but it must be viewed in the light of the then existing conditions. Women then had no share in the world’s work, and were driven to dispel ennui with the needle. The lady of high degree in her solitary grandeur and the nun in her cloister, impelled by the desperate necessity of doing something to while away the endless hours, gave to the world work of unrivaled magnificence. Pieces of old embroidery still extant show a leaning toward that which could be appropriated for church use — altar frontals, copes, chasubles, and vestments of all kinds. The most beautiful work done by titled ladies and nuns, especially previous to the eighteenth century, was presented by them to the church. Such gorgeous robes and trappings as we have never seen in our day, and could scarcely imagine, were its property. A vestment belonging to a Pope of the ninth century represented the wise virgins with their lighted torches, while another was embroidered on a ground of amber-colored satin, with peacocks decked in all their brilliant plumage. The days of romance and chivalry would have been shorn of half their interest were the knights not decked in such gorgeous array. Their garb was rich with the embroidery of fair hands, especially the surcoat and scarf. It is related of Sir John Chandos, one of the most gallant knights of Edward III, that he became entangled in his exquisitely embroidered but ridiculously long surcoat, and fell, receiving while down his death blow. Across his surcoat was a scarf which some “faire ladye” had worked with her “nedil,” and bestowed upon the knight to show her preference. The quaint costumes of colonial times were vastly enhanced by their decorations of embroidery. Embroidered petticoats and girdles, capes, and mantles were every woman’s property, and the men were richly costumed in embroidered garments. There were richly worked cuffs and wide collars; then there were the bead purses, the handbags, and countless other accessories. The fashion of wearing aprons was then in high favor, and lessons were given and patterns sold for embroidering in Dresden and darned work and in cross stitch. Samples of these aprons were sent from England, and were seized upon and eagerly copied by colonial dames. An old mansion on the outskirts of New York, built in Revolutionary days by a Van Courtlandt, contains some genuine specimens of work done in colonial times and when our country was still in the days of its youth. One is a splasher, worked in 1764 by Rhoda Marsh, wife of Colonel Ebenezer Marsh, of Litchfield. It is a white linen one, with shaped edges that are hemmed. A graceful border on the order of French embroidery resolves itself at each corner into an urn with flowers, from which four pieces branch toward a similar one in the center. The curious and interesting part of this piece is a picture worked above the central figure. It represents a house set upon a terrace, surrounded by trees, with birds perched upon its branches. To one side is a barn and to the other a pond, upon which ducks are placidly resting. All this picturing is done in fine, white embroidery cotton, like the rest of the splasher. Letting our imagination run riot a little, we can readily guess that this was the home of Rhoda Marsh, which she so loved that she must even perpetuate it with her needle. Intense love of country life must have been a characteristic of the age, evidenced by the tenor of their designs, especially in the most curious piece in the collection — a bedspread made by hand a hundred and twenty five years ago. It is done upon coarse, soft cotton, the centre having large curving stems and leaves in shades of blue green and light brown. Upon the two sides of this spread is the most remarkable border. Sixteen rows of varying shades of this same blue green, divided by one or two rows of the brown, form a background. Each row is half an inch wide, in a simple up and down stitch. On this background is depicted the typical every-day life of the farm. There is the old house and windmill; there are the barns, and the cattle grazing peacefully in the field. The dairy maids are carrying their pails back and forth, and here and there one has met a farm hand and is making merry with him. Nothing is left out — birds and trees, dogs and fowl, all are there — and one can see the busy life of the well-ordered farm, where every one is happy and the business of the day goes on with the regularity of clockwork. Without a trace of beauty in line or in coloring, this piece has about it a very potent fascination, as indeed have all pieces, beautiful or not, that have survived the ravages of time, for association and sentiment have given them an added meaning. We can only hope for our own work that at least it will mean as much to those who come after as does the work of old times to us.